This fall, Tales of Xillia 2 will be released in Japan. Familiar faces will return, but the game takes a year after the first Xillia. Thus, some characters have aged—notably, Jude Mathis. A year is a long time when you are a teen, especially a teen in a JRPG. 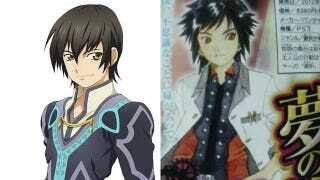 In Tales of Xillia, Jude was a 15 year-old medical student. In the sequel, he's a researcher with a snazzy white coat and in desperate need of a pocket protector. And just look at that hair!